Defining one's golf handicap will better help gauge progress on the course. Experienced weekend and novice golfers alike often throw around the term "handicap" in describing the progress of their respective golf games. And while this term might be foreign to those not familiar with the game of golf, to those who play, properly defining the term is vital to gauging the progress of one's game. A golf handicap is a number assigned to a golfer that accurately reflects that golfer's skill level, reflecting the approximate number of strokes a golfer is able to shoot in relation to even par. The lower the handicap, the better the golfer, and vice versa. The term "scratch golfer" is used to designate a golfer with a handicap of 0, meaning these golfers can expect to shoot even par on a USGA-approved course. A "bogey golfer," meanwhile, will carry a handicap of 18, meaning his score indicates averaging a bogey on each of the course's 18 holes, hence 18 over par and a handicap of 18. The highest handicaps the USGA recognizes for men is 36, while women increase a bit to a maximum handicap of 40. A handicap of 20 or above is generally considered to be a high handicap. 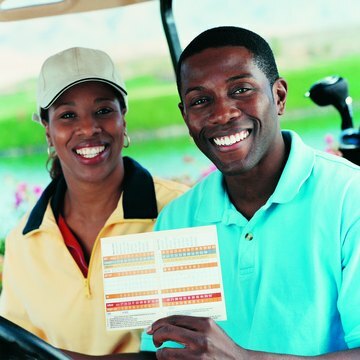 Handicap is best used to serve two purposes--evening the field in scramble or tournament play and providing a baseline by which golfers can measure progress. For the former, an 18-handicap golfer may have 18 strokes docked from his final score at the end of a round, while a 4-handicap golfer may only drop four strokes, in order to even the playing field. For the latter, meanwhile, handicap allows golfers to accurately gauge their progress, as would be the case on a golfer going from a 22 handicap to a 12, thereby shedding 10 strokes off her average round. Course and slope rating also factor into a golfer's handicap. A course rating tells scratch golfers how difficult they can expect the course to be. For instance, a course rating of 72 is what a scratch golfer can expect to shoot in a given round. Meanwhile, a slope rating tells bogey golfers what they can expect to shoot in a given round.